Work out how many acrobats are needed to form square-shaped human towers. Start by building a square tower with four acrobats: two acrobats in the base layer and two acrobats standing on their shoulders. 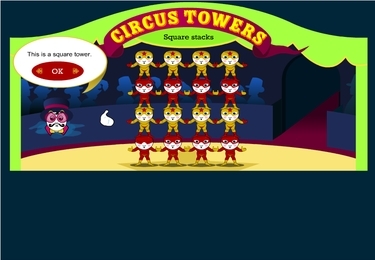 Examine a table and graph of the total number of acrobats in the towers. Predict the number of acrobats needed to build bigger towers. Describe how the number pattern is formed. Students identify and extend spatial and number patterns. Students observe how spatial patterns may be represented in tables, graphs, text and mathematical symbols. Students identify numerical characteristics of spatial patterns. Students enter data into tables. Illustrates the usefulness of tables and graphs to identify and display patterns. Introduces students to non-linear graphs. Students generalise multiplicative patterns and rules using words and algebraic forms. © Education Services Australia Ltd, 2016, except where indicated under Acknowledgements. This material may be used in accordance with the Creative Commons Attribution-ShareAlike 3.0 Australia (CC BY-SA 3.0 AU) licence https://creativecommons.org/licenses/by-sa/3.0/au/.